For years I have been hoping that they’d make a decent series of movies from Clive Cussler’s Dirk Pitt adventures. While Sahara is closer in spirit to a Pitt novel, and is far superior to the abhorrent Raise The Titanic, it still misses the mark. Those familiar with Cussler’s novels know that he specialises in labyrinthine plots, usually with an event from the past, having an effect today. Obviously, for a two hour movie, many of the subplots have to be jettisoned (and thankfully, the film-makers removed the Abraham Lincoln subplot), but the ones that remain seem to have been scrambled and lost their purpose. For example; in the book Pitt and Al Giordano are sent on a mission to find the source of a deadly red algae that is polluting the Niger River and causing severe environmental problems. In the movie, Pitt and Giordino stumble upon the red algae whilst hunting for a confederate Iron Clad battleship in Africa (more on the plot later). As you can see, the events between the book and movie are similar but motivations change, and in a sense the characters have changed. Pitt in the movie is more of a treasure hunter than an operative (special projects engineer) for NUMA (National Underwater Marine Agency). Onto the movie. The film opens in Richmond, Virginia. It is 1865, and the American Civil War is drawing to a close. A Confederate ironclad battleship is being loaded with coins, before running a blockade on the river and disappears into the night. After this prologue, we move to present day and into Nigeria. Eva Rojas (Penelope Cruz) is a W.H.O. (World Health Organisation) operative who is investigating a disease that seems to be spreading at an alarming rate. All the people she discovers with the disease have all recently been in Mali. Because of an ongoing civil war, the W.H.O. will not allow Eva and her partner, Carl (Delroy Lindo) to cross the border. One of the men that Eva has recently discovered with the disease, had recently returned from Mali with his father. The father works in a lighthouse on the coast. Eva decides to drive out there alone to get a blood sample. But some people aren’t happy with Eva’s work. She is causing too many waves and needs to be silenced. Some Arabs dressed in black jellaba’s follow her to the lighthouse. Outside Eva is attacked and pinned to the ground. One of the men pulls out a large knife, but before he can use it, a three-pronged bolt from a spear-gun skewers his hand. 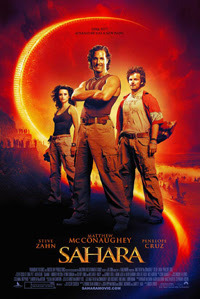 Dirk Pitt (Matthew McConaughey) springs out of the sea and into action and rescues Eva. She passes out and is taken back to the Martha Anne, a NUMA research vessel that Pitt is currently serving on. NUMA are currently retrieving an ancient artefact from the ocean floor. When Eva awakens, the ship is a hive of activity as a sarcophagus is raised from the ocean. The relic is to be unveiled at the Lagos museum that evening. Whilst on board, she meets the NUMA team. Pitt, Al Giordino (Steve Zahn), Rudi Gunn (Rainn Wilson), and Admiral James Sandecker (William H. Macy). Just before the unveiling, from one of his dubious contacts, Pitt receives news on a mysterious Iron Clad that legend has it, was wrecked in a storm, off the coast of Africa. Most people, think that the legend is a load of bunk, but not Pitt. Pitt is obsessed with finding the wreck of the Confederate Iron Clad Battleship, the Texas. He has followed clues over the years, that have led him to believe that it made an ocean crossing all the way to Africa. Eva Rojas attends the unveiling of the sarcophagus, at the Lagos Museum. Through Admiral Sandecker she is introduced to a wealthy industrialist, Yves Massarde (Lambert Wilson) who has contacts in Mali. Eva hopes, that he can get her permission to go into Mali. Massarde isn’t quite what he appears to be. Sure he could get her into Mali, as he has entered into a dodgy agreement with the warlord ruler of Mali, General Kazim (Lennie James). But Massarde, doesn’t want her interfering with his plans, but tells her that he’ll ‘see what he can do’. Meanwhile Pitt’s contact has given him a Confederate Dollar coin. Apparently only five such coins were struck up as samples before the end of the Civil War. Four of the samples have been found. The fifth was given to the captain of the Iron Clad, Texas. And rumour has it, in this neck of the woods, that the Iron Clad actually sailed up the river Niger to Mali in 1866. Pitt is excited. He believes he is getting closer to finding the wreck. Sandecker on the other hand, believes that Pitt is chasing a ghost story, but still gives him three days to investigate. He also gives him permission to use his very expensive, high powered motor boat, the Caliope. The next morning, waiting at the docks are Eva and Carl. Sandecker has arranged for them to hitch a ride with Pitt, Giordino and Gunn. The trip begins uneventfully, and the NUMA team drop Eva and Carl off at a village along the river, and then continue their quest. Thinking the ship may have sunk, they tow a sonar buoy behind the boat. When the readings are incorrect, they reel the buoy in and discover that it is covered in red algae. On a flowing, fresh water river, this is very strange. Gunn takes a sample to be analysed. Outlining all the twists and turns that take place in a Dirk Pitt adventure is a huge task, but needless to say that Eva and Pitt’s paths cross again. And, of course there are quite a few large scale action set pieces along the way. One of the highlights is a boat chase on the Niger River, when a flotilla of General Kazim’s armed patrol boats try to stop Pitt, Giordino and Gunn. The chase ends when the NUMA boys pull a ‘Panama’. What’s a ‘Panama’? You’ll have to watch the film to find out. The casting for Sahara is interesting. The film is miscast, but nowhere to the same extent as Raise The Titanic. McConaughey is rather laid back as Pitt. Pitt, in the novels had a little bit of ‘military’ about him, but McConaughey is more of a beach bum. But his easy going style strangely won me over as the film progressed. Steve Zahn, as Al Giordino, is also miscast. Giordino, in the books is big and strong. Zahn doesn’t look physically imposing, but his performance in the film is great, in a slight comic relief kind of way. After the failure of Raise The Titanic and the lack lustre performance at the box office by Sahara it may look as if Clive Cussler’s Dirk Pitt stories just aren’t good cinematic fodder. I beg to differ. If you look at the success of National Treasure you can see the Pitt formula in action. The opening scenes with a frozen boat are similar to Cussler’s Atlantis Found. Another film that had a touch of Cussler, was Out Of The Blue. Sure, it veers to weird drug culture gangster film near the end, but for three quarters of it’s running time, the underwater salvage scenes could come straight from any Pitt novel. I am sure with a polished script (and so far that seems to be the hardest part), and a decent team behind the camera (and in the water), we could see a great Dirk Pitt film in the future – But will it ever happen?